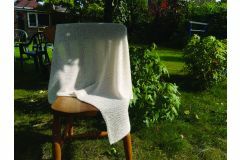 This square garter stitch blanket with choice of plain or lacy edges has no cast on or cast off edges to make it hard and unyielding when you need to wrap up baby or yourself. Finished size 80x80cm with instructions to make smaller or larger. Optional DK Blanket: 6 x50g balls Superfine Alpaca or Baby Alpaca & Silk in DK. A 4.5mm long circular needle and sewing up needle.